The AURUM PT Series, a high end modular PSU, is designed specifically for gaming enthusiasts and demanding overclockers. At 80 Plus® Platinum certification, the AURUM PT Series delivers a premium product and is the ideal choice for those seeking high-performance, reliability and quality. 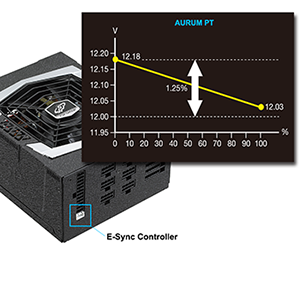 The AURUM PT Series delivers high-performance at a great cost-to-power ratio. To do this safely, the AURUM PT features full industrial-grade Japanese capacitors and solid capacitors on the secondary side. This ensures the +12V Single-Rail Design delivers consistent ripple free power. In addition, E-Sync Remote-Sensing provides Synchronized 3.3V/5V/12V with a superbly stable signal. E-Sync Remote-Sensing is an FSP exclusive technology that provides superior noise and ripple suppression. Arrow-shaped ventilation to provide remarkable air ventilation and superior cooling performance. Synchronize 3.3V/5V/12V with stable signal, allows AURUM PT to provide better ripple/noise performance. 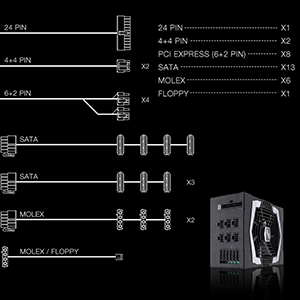 13 SATA and 8 PCI-E cables provide the most flexible support for your hardware setup. 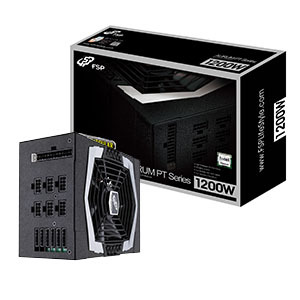 FSP's power supply provide 100% Compatible with Haswell CPUs. 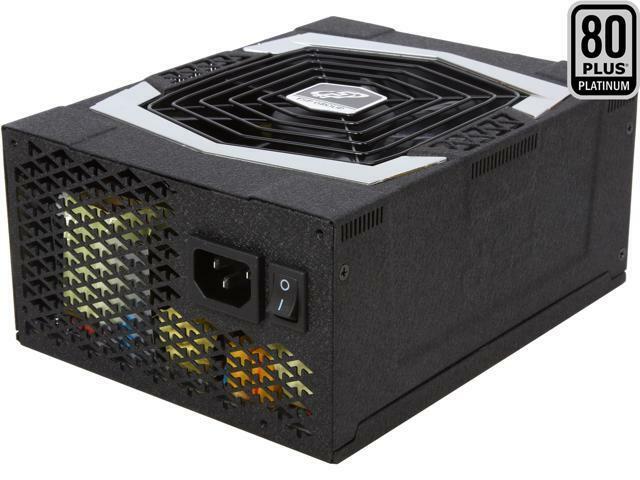 Strong Single +12V Rail Compliant with ATX12 v2.4/EPS12 v2.9 specifications, the FSP Group AURUM PT1200FM power supply delivers 1200W total continuous output @ 40°C. The single +12V rail offers the high current needed to power your high-end CPU and GPU, as well as a multi-GPU configuration. Synchronize 3.3V/5V/12V with a stable signal to provide better ripple/noise performance. 80PLUS Platinum certified The 80 PLUS Platinum certified power supply provides ultra-high power efficiency of at least 92% at any load between 20% and 100%, saving you money on your electric bill, reducing heat in your computer's system, and prolonging its life. 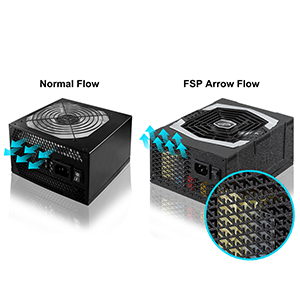 Silent Cooling The FSP’s unique arrow-flow technology provides remarkable air ventilation and superior cooling performance. High-quality Japanese capacitors This power supply utilizes 105° Japanese-made capacitor and a solid capacitor, providing a higher quality over regular electrolytic caps. SLI and CrossFire Ready With eight 6+2 pin PCI-E connectors, and SLI and CrossFire support, you can build a multi-GPU configuration for the maximum graphics performance. Enhanced cable management The unique SATA array cable design allows for better cable management. The modular cable design allows use of only the cables you need, resulting in an improved internal airflow with reduced system clutter. Other Thoughts: I originally bought corsair ax1200i but quickly went dead within hours of usage with burning smell. Luckily, I immediately got this as replacement and installation was quick and painless. No burning smells and psu is running silent. Lesson learned, always buy from true manufacturer than private label. 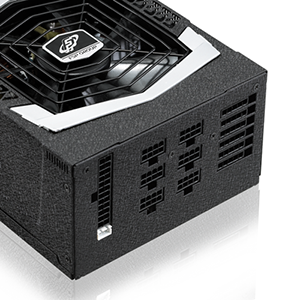 Other Thoughts: This PSU has plenty of power and for gamers, you will for sure love this because it is completely silent. Review already shows this baby should be enough power if you throw tons of upgrade or even get to 3-4 high end via cards SLI/crossfire. I yet need that kind of upgrade but very tempting to try after seeing how it performed on my rig. Cons: - Don't just install without going through the user manual, you may screw up if you don't connect things right, user manual have all the detail info of each connectors. - You will need a decent size case if you have multiple HDD & the right motherboard to handle 2+ VGA cards, this can takes up tons of space. Other Thoughts: If you are a true gamer with multiple VGA cards or a graphic designer with multi-monitor output/VGA cards, or simply loves overclocking, then this PSU will be one of the best option available. I got it because I've seen this PSU handling 4 x Nvidia Titan cards + overclocking and is still quiet. Pros: I have two babys I need to take care of during a day. Super quiet fan plus its E-Sync remote make my desktop really quiet! So I can enjoy my game time while my babys are sleeping! Moreover, I am fully satisfied about the stable and high efficiency of PT1200FM. I will definitely get another one for my husband. Cons: I'm satisfied so far. Other Thoughts: Just get something better. This isn't worth your money.